The M1 was a good tank, but the M1A1 improved on it with survivability features like NBC protection and blowout panels for ammo lockers. It also added the heavy-hitting power of the Rheinmetall 120mm smoothbore gun. These guns, loaded with depleted-uranium shells, proved extraordinarily lethal to the tanks of the Iraqi Army. 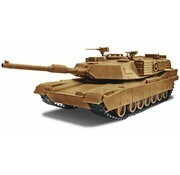 Now you can build America's toughest tank in a 'snap'! SnapTite kits are perfect for introducing new modelers to the hobby and history. This kit features glue less, snap-together construction, pre-painted polystyrene parts and illustrated instructions.